"Bullet train" High Speed Passenger Rail services often grab the headlines ), but much of the actual services that we will see starting up in the final years of this decade will be work on or preparation for the "Rapid Passenger Rail" services that upgrade top speed from the sluggish conventional US corridor speed of 79mph to 110mph or more. As you are probably well aware, the US Government is gridlocked, which means that for years and years, nothing has been getting done. However, because of the appropriations for "High Speed Rail" in 2009 and 2010, things are being done right now. "Bullet train" High Speed Passenger Rail services often grab the headlines (and you can watch a fairly hokey California HSR Authority youtube video on what they did in the first six months since construction started), but much of the actual services that we will see starting up in the final years of this decade will be work on or preparation for the "Rapid Passenger Rail" services that upgrade top speed from the sluggish conventional US corridor speed of 79mph to 110mph or more. The primary Rapid Passenger Rail project is the Chicago to Saint Louis "HSR", which will cut about an hour from the present five and a half hour trip. The majority of this project will be completed next year, though some work will continue into 2018. Other projects are underway in Michigan, on the Northeast Corridor, and in the Pacific Northwest. The Illinois "HSR" project was launched in 2010. A substantial amount of the required track upgrade work was completed between 2010 and 2012, but passing track, bridge replacement and rehabilitation, and drainage improvements were still required. Much of the corridor has level crossings, and 110mph operation requires upgrades to rail crossings, with speed detecting four-arm crossing gates replacing the original two-arm gates. It appears that work on rail crossings is much of what the Illinois Department of Transportation will be engaged in before the projected Summer 2017 expansion of Rapid Passenger Rail service from the 15 mile trial 110mph section between Dwight and Pontiac to most of the corridor. Positive Train Control is also required for 110mph operation. Under Positive Train Control (PTC), a train will not proceed through a crossing unless the crossing signals that it is clear of traffic. If no signal is received, it will automatically slow to a safe stopping speed, and if the crossing is still blocked, will stop. Similarly, if a section of track is occupied, by either a slower train moving in the same direction or an oncoming train, the train is automatically slowed and then stopped until the track is clear. Train service on this corridor is presently provided by the daily Texas Eagle, from Chicago through Saint Louis and on to San Antonio, complemented by four Lincoln Services. In the "No-Build" alternative in the EIS, the existing Amtrak corridor would have been used, with three of the existing Lincoln Services upgraded to 110mph, and this provides the baseline for the operation at completion of the present project. •For Chicago / Normal, 2:14 travel time drops to 1:57 No-Build, 1:53 full build, and 1:43 full build express. The Ongoing Illinois Budget Crises (OIBC) have not disrupted this project, because the majority of the funding comes from the 2009 / 2010 Federal HSR appropriationsm, and the state funding match has already been allocated. However, one likely impact of the OIBC is the it seems likely that the improvements we see before the end of the Twenty Teens are likely to be limited to the existing services. Expanding to the ultimate target of eight services per day each way would require additional capital subsidy to buy new trains, and given the OIBC, that doesn't seem likely to be showing up anytime soon. As long time readers of the Sunday Train know, Rapid Passenger Rail is not just about effective trip times. The three target benefits are travel time, service frequencies, and service reliability. And the investments presently being made are expected to also improve service reliability, improving on-time performance from 75% to 85%. The planning of the Chicago to St. Louis Rapid Rail corridor has built into it a presumption that the Amtrak Texas Eagle service continues to operate as a 79mph rail service. However, the new Amtrak long haul locomotives and rolling stock are capable of 110mph operation. At the very least, if the Texas Eagle is scheduled as a 79mph service, when it is operating on the Rapid Rail corridor, it will be in a position to pick up the pace if it should happen to be running behind schedule. So the Chicago / St. Louis Rapid Passenger Rail service project continues to progress toward launch, despite gridlock in Washington DC and the OIBC. It is not the only project underway, however. 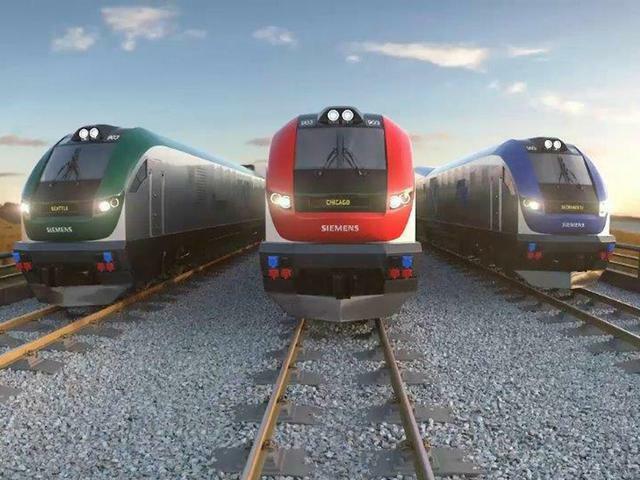 The other Rapid Passenger Rail project that is underway is also connecting to Chicago. This is the Detroit to Chicago corridor, which is the beneficiary of my Governor Kasich's decision to give the money for the Ohio 3C railway back. Amtrak owns the Michigan Line, from Porter, Indiana to Kalamazoo, Michigan, and had started track improvements to allow increased operating speed in the early 2000's, while the MDOT had started to work toward buying the corridor between Kalamazoo and Dearborn later in that decade, completing the purchase in 2012. Upgrades already made have trimmed half and hour off of the Detroit to Chicago time of the three Wolverine services. Across the continent, the Cascades Corridor in Washington and Oregon received funding to reduce passenger and freight train interference, speed up passenger train operations, and allow the introduction of additional rail frequencies. Twelve of the 20 projects that were funded have been completed, and the remaining eight are in progress and expected to finish by 2017. The projects are expected to improve service reliability and will also allow the current four Cascade services each way to be increased to six. These projects do not include raising the speed limit to 110mph. However, they do lay the groundwork for a speed upgrade in two different ways. First, the speed limit of a rail corridor does not much matter to a train that is stuck waiting for another train to clear through a single track section or some other bottleneck. The strongest benefits to a speed upgrade occur when the trains in a corridor are going to be spending much of their time close to the speed limit. Second, the economic benefit of the speed upgrade is leveraged by having more services on the corridor. It is so hard to justify a Rapid Passenger Rail upgrade in a corridor that only sees one service a day. Making the investments to permit six conventional rail services to operate on the Cascades Corridor will substantially boost the economic benefits of a Rapid Passenger Rail upgrade when the current HSR policy gridlock is finally broken. In addition to the Conventional and Rapid Passenger Rail projects I touched on, and the ongoing California High Speed Rail project, there is ongoing work on the Northeast Corridor, which I will take a closer look at another time, and also a wave of HSR and Rapid Rail corridor studies progressing, including in Virginia, for a Michigan passenger rail corridor north of the Detroit to Chicago corridor, and several others. There is also the Rapid Passenger Rail corridor from Miami to Orlando which I have looked at before and shall again.